I don’t spend much time in church, but if they had videogames there, I might show up more often. I like to think that if religious institutions had an arcade, we’d all be spending more time bending the knee to the gods of gaming. And if there were a videogame church, it would feature stained glass images like this one surrounding the house of worship. 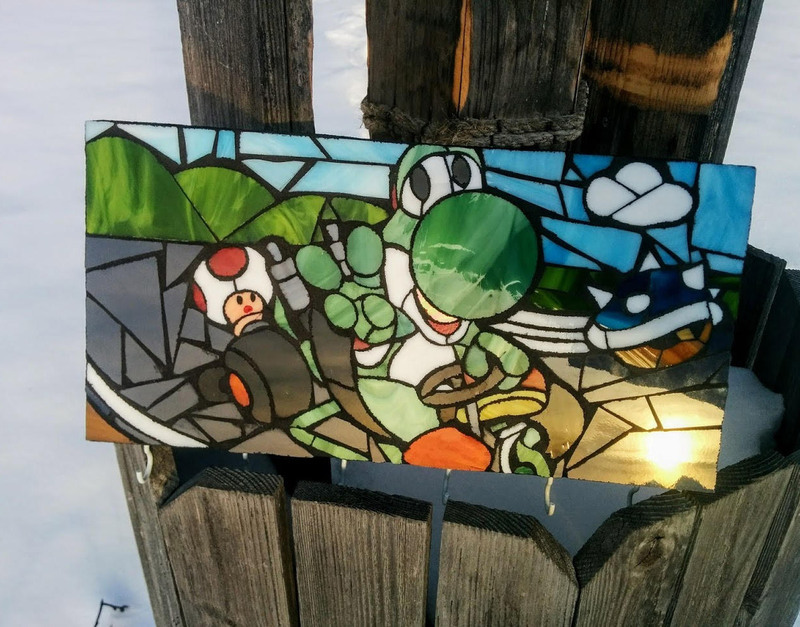 This fun and artful 12″ x 6″ stained glass mosaic features a scene of Yoshi going for a ride in his Super Mario Kart racer, with Toad hanging out in the back. They’d better watch out though, because somebody has tossed one of those spiny Koopa shells onto the road to pop their tires and spin their kart. This neat piece of original fan art was created by Wildnine Studios, who makes all kinds of cool and geeky stained glass mosaics, like this awesome Mario Power-up tissue box. The Yoshi and Toad scene is going for $295 over on Etsy.